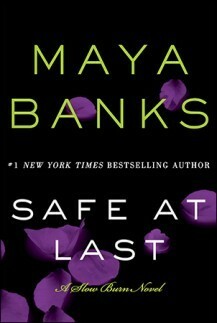 Safe at Last by Maya Banks is the third book in the Slow Burn series but can be read as a stand alone book. This a second chance romance between Zack Covington and Anna Grace (Gracie), his high school sweetheart and soulmate. Zack is devastated when Gracie suddenly disappears with no clue as to where she is or what happens. It destroys a big piece of Zack, never knowing what happened to Gracie and for twelve long years, he’s mourned her loss. Fate, however, has a funny way of playing it’s part and on the day that Zack decides to move on, he walks into an art gallery to take a job and runs into Gracie. Before he can get any answers from her though, he’s shocked to find that Gracie disappeared on purpose and wants nothing to do with him. The expression on her face when she sees him crushes him and he doesn’t understand what happened in the past to make her run. When her life is placed in danger and forced to be together, will they be able to overcome their past or was this love never meant to be? Wow!! This was a seriously emotional book. A touch of sci-fi, emotional angst, turmoil; this book had it all and I seriously couldn’t put it down. I did want to see a little more of Gracie and Zack as a couple and not just the journey of them being together again. I guess I was looking for just a little more romance even though I’m not knocking the suspense or the mystery into Gracie’s disappearnace. That was great and the characters have been through so much, I think the ending was perfect for the two characters. I can’t wait for more in the series.